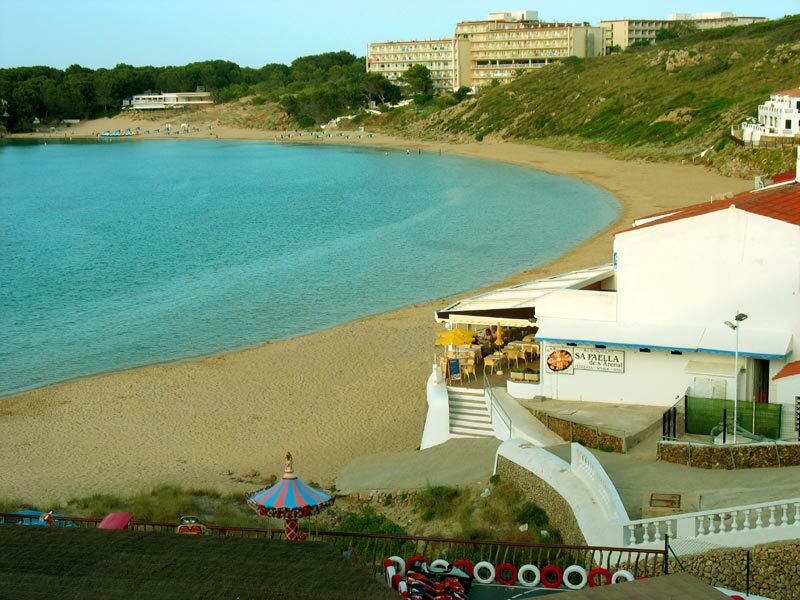 Arenal D'en Castell situated on the north coast of Menorca, and only a 20 -30 minutes drive from the airport and Mahon. 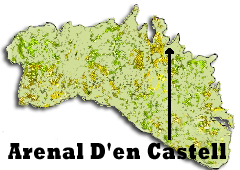 Na Macaret, Son Parc and Fornells are other resorts close by and easily reached. The big attraction for most visitors who choose Arenal d'en Castell for their summer holidays is without doubt the magnificent beach and its water sport facilities. The beach is a large nearly circular crescent of fine golden sand, some say the finest on the whole of Menorca, with the usual sun beds and parasols for hire. Along with other resorts on Menorca, Arenal d'en Castell has a mini land train running around the town and as far as Na Macaret throughout the day and well into the night. The resort is also serviced by a bus service to Mahon and a taxi rank located on the main resort road by the commercial center overlooking the beach. The resort has every type of accommodation to suite budget and taste. There are two large hotels one, the family orientated Hotel Aguamarin situated right on the beach as you enter the resort, the other is the quieter Fiesta Castell Playa perched higher up overlooking the resort and beach. Self catering apartments and villas are plentiful along with a great choice of bars, restaurants and shops to service them. 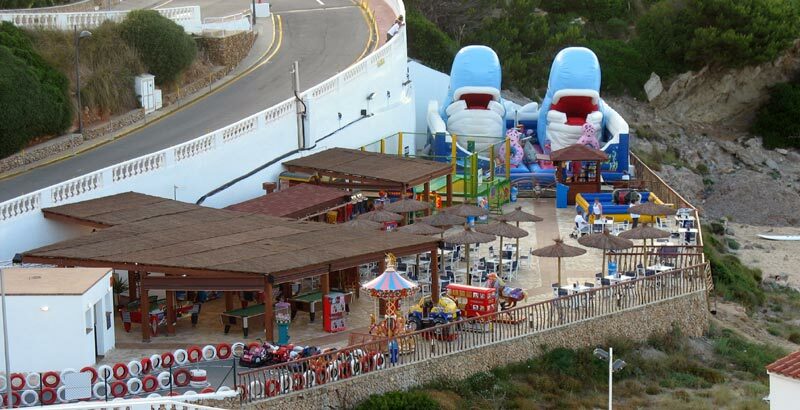 The resort also has two play areas for the younger ones, one on the commercial complex in Coves Noves, a few minutes walk from the center, the second near the White Sands apartments, where the parents can sit close bye with a drink and keep a eye on them. Dinning out won't be a problem as Arenal D'en Castell has a great choice of restaurants to choose from, plus a few bars, some of which have evening entertainment in the season. For a change of scenery the small hamlet of Na Macaret with it's good restaurants and small beach is a pleasant walk away. Fornells, the picturesque fishing village is well worth a visit and is only a short ride away. 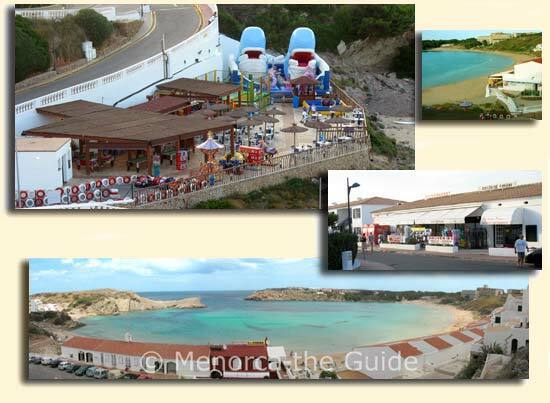 Not forgetting Mahon Menorca's capital which should be on everyone's list is easy to get to by bus or hire car.